Finally, a retailer is offering an alternative to the wasteful, frustrating packaging that you usually have to tear open with knives, scissors, or worse. I've nearly cut myself on some of these packages in the past. 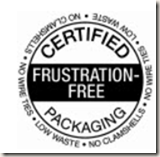 Amazon's "Frustration Free" packaging is innovative thinking in this world of impossible-to-open plastic packages. I can only hope this spreads to other companies. 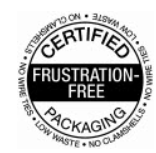 Amazon Frustration-Free Packaging, a multi-year initiative designed to alleviate "wrap rage," features recyclable boxes that are easy to open and free of hard plastic clamshell cases, plastic bindings, and wire ties. The product itself is exactly the same--we�ve just streamlined the packaging. Learn more.